The American Recovery and Reinvestment Act of 2009 (ARRA) initiated a movement in healthcare towards community-wide coordinated care systems. Today, the majority of these new systems are recognized as Accountable Care Organizations (ACO). Their objective is to provide population-wide, community-focused coordinated care. However, since ACOs are still an early concept, most organizations struggle with defining a population-wide coordinated care system and what goes into building one. The Garage's deep knowledge of healthcare combined with strong tech focus has worked with many organizations to develop a guide for a successful care coordination system. Code-named the "Airport" this guide depicts the journey a patient takes in a coordinated care organization. As an airport's terminals help commuters reach their destination, the Airport's terminals help the ACO provide better care to patients, improve the community’s health, and lower the system's costs. All the terminals are connected via a main terminal, the Airport's Care Terminal.  Each concourse in a terminal are subsets of that line of business providing integrated delivery systems, with each function that delivers care, their own gate.